In what I believe is Micheal Mann’s greatest film, we also get what I believe to be Tom Cruise’s best performance. Collateral sticks with me because of the amazing story and the fantastic action sequences put together by Micheal Mann. Collateral is one of those action movies that is so much more substance over style while still finding a great balance between the two. If you haven’t seen Collateral I highly recommend you check it out. I absolutely adore Big Trouble in Little China. It produces one of my favorite cinematic characters of all time in Jack Burton. It also contains one of the wackiest stories I’ve ever seen. But the funny thing is……It all works! Sure it isn’t for everyone, but I would argue that all John Carpenter films work that way. In my own opinion Big Trouble in Little China is a cult masterpiece. If you never seen Inglorious Basterds….you really need to….like soon. Quentin Tarantino is an absolute genius and just the premise of Inglorious Basterds is beyond intriguing. Brad Pitt is fantastic, and Eli Roth does something other than completely disgust me. However Christoph Waltz gives the best performance of the film and one for the ages. Even if you don’t watch the whole movie, watch the opening scene with Waltz, you won’t regret it. When I first saw The Shining it absolutely blew my mind. It was the first Kubrick film I had ever seen, and I would even say it that it completely changed my perception of movies in general. I’ve probably seen it upwards of about twenty times and I notice new details with each new viewing. It has a creepy vibe that pulls you in and your mind does the rest, you just can never stop thinking about it. Go watch the Shining, unless you are squeamish….then don’t. My favorite film all time is Pulp Fiction. This may seem like the stereotypical choice with it being widely considered the best film of my favorite director. 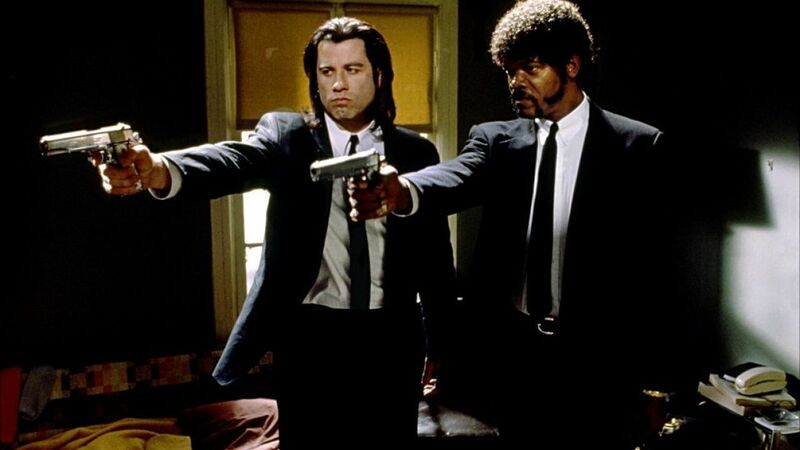 There has always just been something special with Pulp Fiction. From the first time I watched it till now, I stare at the screen amazed for 3 hours. The way to story is told is absolutely revolutionary. Tarantino blew open the 90’s with Pulp Fiction and the entire cinematic world was never the same.